Welcome to Wenlin Institute, where we make some of the world’s most advanced software and dictionaries for learning, reading and writing Chinese language. Wenlin Software for Learning Chinese integrates a variety of tools for instant-access to more than 300,000 Chinese-English entries, 73,000 Chinese character entries, 62,000 English-Chinese entries, and 11,000 Seal Script entries. Wenlin’s versatile and easy-to-use interface tackles the most frustrating obstacles for students, scholars, and speakers of Chinese. 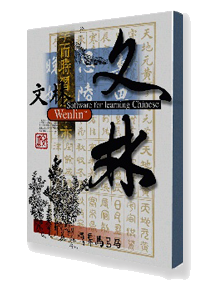 Wenlin’s integrated solution runs on a variety of computer platforms (including Mac and Windows), and includes expandable Chinese dictionaries, a full-featured Unicode text editor, a flashcard system, pronunciation recordings, handwriting recognition, and much more. Wenlin is a comprehensive study tool, for beginning students, for life-long speakers, and for advanced researchers alike. Having Wenlin at hand is like having a seasoned scholar on your desktop! Wenlin Institute is the home of the pioneering ABC Chinese-English / English-Chinese Dictionary edited by John DeFrancis. Wenlin Institute maintains the on-going development of the ABC Dictionary Series including the new electronic edition of the ABC Dictionary of Chinese Proverbs. Wenlin Institute is also the home of the《說文解字》Shuōwén Jiězì Translation Project. Wenlin Institute is an Associate Member of The Unicode Consortium, contributing to development of The Unicode Standard and its public data components. At Wenlin Institute we build some of the world’s most advanced software development tools and databases for processing, indexing and rendering CJKV (Chinese, Japanese, Korean, and Vietnamese) text, including Wenlin Character Description Language (CDL). Let us help you integrate advanced Wenlin technologies into your software applications today!